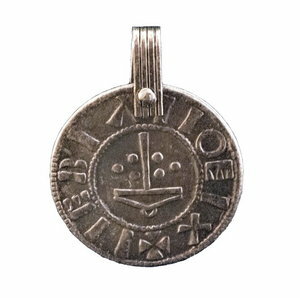 Webshop - Gotlands Museum - Pendant in silvered tin. Replica from York. Home » Jewelery » Pendant in silvered tin. Replica from York. Pendant in silvered tin. Replica from York. Penny from York (Jorvik), England. Minted for the Irish viking king Sitric Cáech during his reign 921-927. 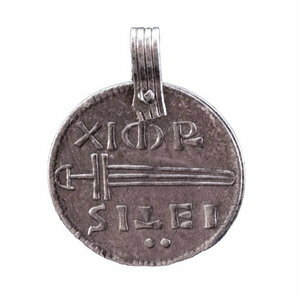 The obverse depicts a sword surrounded by the text "SITEI ICDI+" = Sitric Dominus. The reverse most likely shows Thor's hammer, surrounded by indecipherable words.